Be The First & Be Here Now! 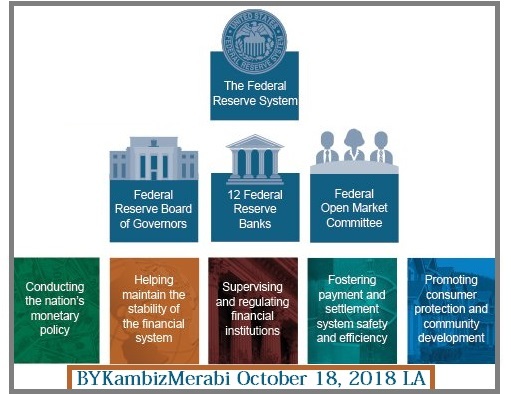 By Kambiz Merabi Luxury Rental Brand..
Impact of the Federal Reserve Board (The Fed) Interest Rate Hike for the third time this year, & The Changes it will make to The Economy here and around the world. October 17, 2018, U.S. Federal Reserve Meeting Minutes of Sept. 26 was released. Here it is in a nutshell the facts: The decision, which was expected, is a sign of increased confidence in the US economy. Unemployment is low, economic growth is strong, and inflation is relatively stable, the rate helps determine rates for mortgages, credit cards and another consumer borrowing. Central bankers raised expectations for a fourth-rate hike in December, with a majority now in favor of such a move. In June, policymakers were split on whether the Fed should raise rates four times this year or three. After its meeting in September 2018, the Federal Reserve decided to hike its federal fund’s rate target range by a quarter point to 2.00%-2.25%. Looking ahead in December we will have another hike, and then to 2019, Fed officials expect at least three rate hikes will be necessary, and one more in 2020. We at MOG Reviewed ,examined and studied of the Financial Situation of the US GDP Growth which was Confirmed at 4.2% in Q2. The European Union economy expanded 2.1 percent year-on-year in the second quarter of 2018, slightly below a second estimate of 2.2 percent and after a downward revised 2.3 percent growth in the previous period. The Japanese economy advanced 0.7 percent quarter-on-quarter in the June quarter of 2018, stronger than the preliminary figure of a 0.5 percent growth and after a 0.2 percent contraction in the previous period. GDP Annual Growth Rate in China averaged 9.58 percent from 1989 until 2017, reaching an all-time high of 15.40 percent in the first quarter of 1993. Well this year second-quarter GDP growth of 6.7 percent from a year ago, slightly lower than 6.8 percent in the first quarter of 2018, and finally India’s GDP grows at 8.2 per cent in second-quarter 2018. On balance, financing conditions for large non finaIntentionally left blankcial, and CRE firms remained accommodative in recent months. In the commercial real estate (CRE) sector, financing conditions also remained accommodative. Although CRE loan growth at banks moderated in July and August, issuance of commercial mortgage- backed securities (CMBS) was robust. CMBS spreads were little changed over the inter meeting period and stayed near their post crisis lows. Residential mortgage financing conditions remained accommodative on balance. For borrowers with low credit scores, however, conditions were still somewhat tight despite continued easing in credit availability. On net, financing conditions in consumer credit markets were little changed in recent months and remained largely supportive of growth in household spending. we View the Current Conditions and the Economic Stance for the next six months to be: In conjunction with the transcript of FOMC meeting, members of the Board of Governors and Federal Reserve Bank presidents submitted their projections of the most likely outcomes for real GDP growth, the unemployment rate, and inflation for each year from 2018 through 2021 on their next meeting and over the longer run, based on their individual assessments of the appropriate path for the federal funds rate. Mr. Kambiz Merabi’s Article/s Published October 18, 2018 LA, has been Updated & posted at 6:44 PM PCT, October 20th, 2018. To be sure to read all our blogs: email Fidel Hernandez and you will receive the full article. join our community of 4,500+ CRE investors and owners and subscribe to BKM’s blog to receive CRE content delivered right to your inbox. The BKM’s blog covers everything you need to stay ahead of the pack in today’s competitive environment of Real Estate, and Commercial Real Estate. Get the Latest Tips, Trends, and Best Practices for Commercial Real Estate Professionals as well Amateur investor. The topics in his blogs include news, trends, leasing, asset management, CRE technology, , and more. Mr. Kambiz Merabi’s Blogs are the place where commercial real estate opportunities and solutions meet. The Fed used the word “accommodative” from its description of monetary policy. That may be a signal that the Fed believes interest rates are finally at a neutral level, that means they neither stimulate nor incumber the economy. The Fed wants to raise interest rates steadily to keep the economy from overheating but avoid raising rates so quickly that it brings on could help start a recession. For now, the chairman has maintained that gradual interest-rate increases are the best way to balance those risks. Changes in interest rates can have positive and negative effects on U.S. financial, and for the world economy. When the Federal Reserve Board (The Fed) changes the rate at which banks borrow money, this typically has a ripple effect across the entire economy including equity prices, bond interest rates, consumer and business spending, inflation, and recessions. However, there is often a delay of a year or more between when interest rates are initially raised, and when they begin to have a tangible effect on the economy. When interest rates increase, there are real-world effects on the ways that consumers and businesses can access credit to make necessary purchases and plan their finances. History and experiencing This article explores how consumers will pay more for the capital required to make purchases and why businesses will face higher costs tied to expanding their operations and funding payrolls when the Federal Reserve increases the target rate. However, the preceding entities are not the only ones that suffer due to higher costs, as this article explains. The recent rise in the Fed funds rate will likely cause a ripple effect on the borrowing costs for consumers and businesses that want to access credit based on the U.S. dollar. A hike in the Feds rate immediately fueled a jump in the prime rate, which represents the credit rate that banks extend to their most credit-worthy customers. This rate is the one on which other forms of consumer credit are based, as a higher prime rate means that banks will increase fixed, and variable-rate borrowing costs when assessing risk on less credit-worthy companies and consumers. Working off the prime rate, banks will determine how credit-worthy other individuals are based on their risk profile. Rates will be affected for credit cards and other loans as both require extensive risk-profiling of consumers seeking credit to make purchases. Short-term borrowing will have higher rates than those considered long-term. Money market and credit-deposit (CD) rates increase due to the tick up of the prime rate. In theory, that should boost savings among consumers and businesses as they can generate a higher return on their savings. However, it is possible that anyone with a debt burden would seek to pay off their financial obligations to offset higher variable rates tied to credit cards, home loans, or other debt instruments. A hike in interest rates boosts the borrowing costs for the U.S. government and fuel an increase in the national debt. A report from 2015 by the Congressional Budget Office and Dean Baker, a director at the Center for Economic and Policy Research in Washington, estimates that the U.S. government may end up paying $2.9 trillion more over the next decade due to increases in the interest rate, than it would have if the rates had stayed near zero. Auto companies have benefited immensely from the Fed’s zero-interest-rate policy, but rising benchmark rates will have an incremental impact. Surprisingly, auto loans have not shifted much since the Federal Reserve’s announcement because they are long-term loans. A sign of a rate hike can send home borrowers rushing to close on a deal for a fixed loan rate on a new home. However, mortgage rates traditionally fluctuate more in tandem with the yield of domestic 10-year Treasury notes, which are largely affected by inflation rates. When interest rates rise, that’s typically good news for the profitability of the banking sector, as noted by investment giant Goldman Sachs. But for the rest of the global business sector, a rate hike carves into profitability. That’s because the cost of capital required to expand goes higher. That could be terrible news for a market that is currently in an earnings recession. A rise in borrowing costs traditionally weighs on consumer spending. Both higher credit card rates and higher savings rates due to better bank rates provide fuel a downturn in consumer impulse purchasing. Although profitability on a broader scale can slip when interest rates rise, an uptick is typically good for companies that do the bulk of their business in the United States. That is because local products become more attractive due to the stronger U.S. dollar. That rising dollar has a negative effect on companies that do a significant amount of business on the international markets. As the U.S. dollar rises – bolstered by higher interest rates – against foreign currencies, companies abroad see their sales decline in real terms. Rate hikes are particularly positive for the financial sector. Banking stocks tend to perform favorably in times of rising hikes. Kambiz Merabi & MOG’s research team LA. As a leader in luxury rental Mr. Kambiz Merabi had relaunches Workplace Management Platform program app called MOG-Host which is improved mobile friendly, that Will Learn What all his Building Occupants Want.